For all those who live abroad, here’s a little something to stay connected with Lebanon! 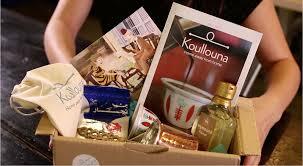 Koullouna is a monthly subscription box filled with Lebanese products, a taste of home delivered right at your door. Through small donations, the subscription will also be a way to support local initiatives that have a positive impact on the country. Experience Lebanon in a box! Bravo Marielle and your team, what a great concept. If you wish to contribute and get your own awesome -home away from home- box, here is the link to their crowdfunding campaign.